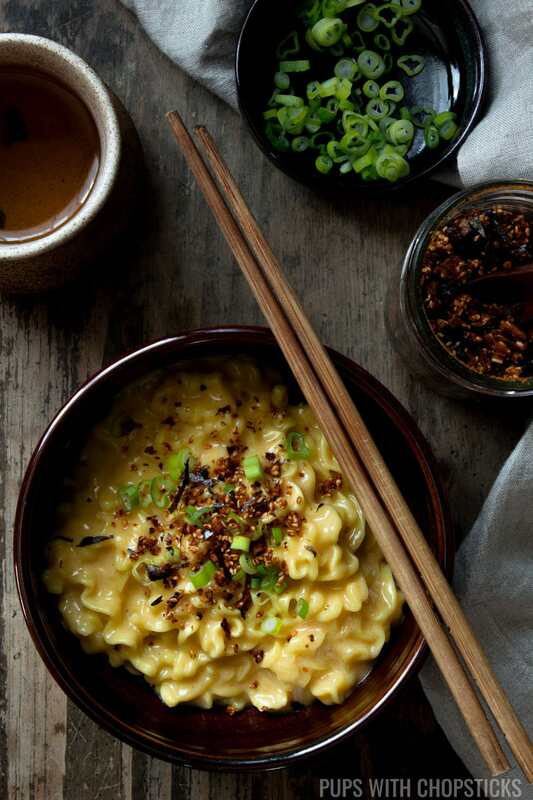 A twist on Mac and Cheese, this cheese ramen recipe uses real cheddar cheese, a pack of instant noodles and a super simple way to thicken up milk to create a creamy, indulgent cheese ramen. Perfect for days when you want a small portion of something creamy, comforting and quick to make. 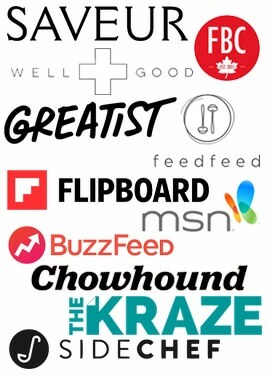 What does Mac and cheese mean to you? To me, it has always been a delicious comfort food. It’s comforting, simple to make, cheesy, tastes great and usually made in a big pot which means lots to eat (or share) – but what if I only want 1 portion? This is where Ram’ & Cheese comes in instead – a one bowl of creamy cheese ramen. 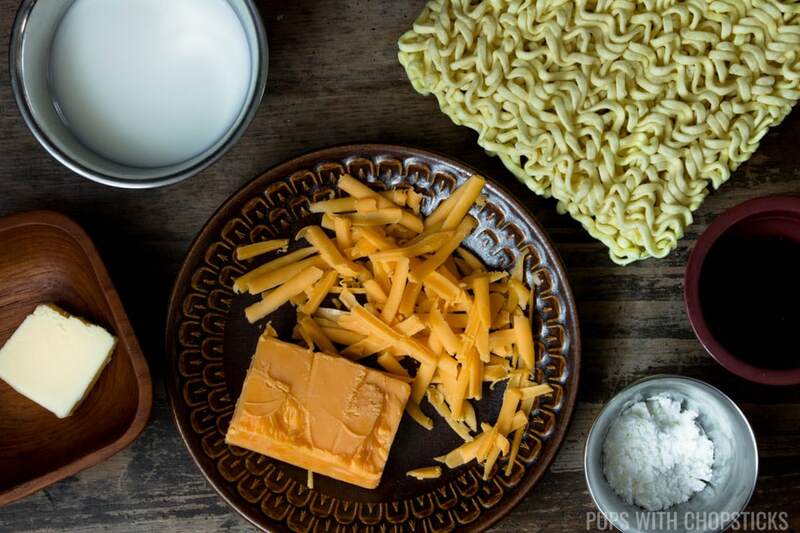 All of the ingredients for this cheese ramen recipe can be found at your local grocery store. When it comes to ramen, I like to use the thicker noodles. I find it has a bit more of a chewy texture (when not overcooked) and usually harder to overcook. The only ones I have ever found that were the thicker noodles were all Korean brand ones. When it comes to mac and cheeses, I like to stick to the staple which is cheddar cheese. However, you can be quite creative and add different types of cheeses to this for different textures! Cheddar – smooth, creamy, and salty with a slight tang. This cheese melts very easily and I like to turn off the heat before adding this in to melt. Mozzarella – not much in terms of flavour but it gives that nice stretchy cheese pull and gives the cheese a bit of a chewiness. I generally don’t like to add too much of this because when it cools, it turns hard and solidifies so you lose that creaminess. This takes a bit more heat to melt as well, so I usually have to leave the heat on for 30 seconds while trying to melt this into the sauce. Cream cheese – add a tablespoon or two for a slight more creaminess. Cotija – salty with a bit of gooeyness. I have used this in the past because I love the saltiness this cheese provides. It also gives the sauce a bit more of a gooeyness. This recipe is very versatile and depending on your mood you can definitely switch it up with different toppings and spices. 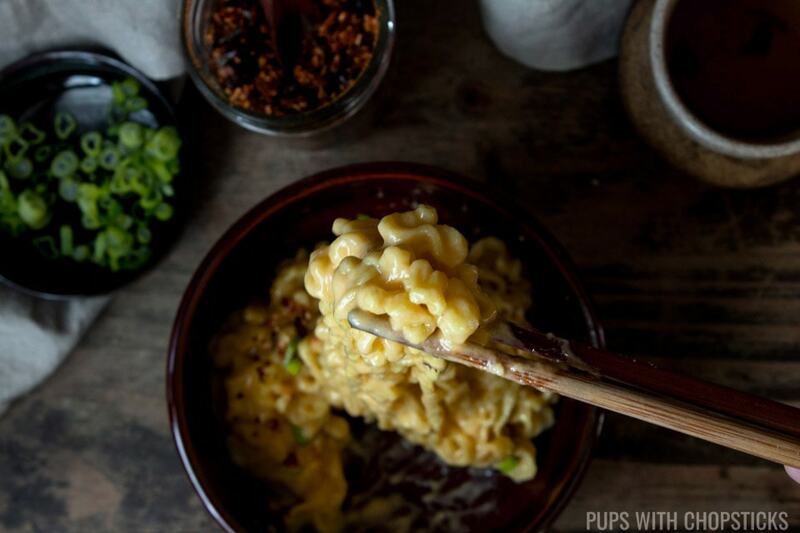 Here are a few ideas for spices to add right into the cheese ramen sauce! A few toppings to add on top of your cheese ramen after it is done! Quick & Simple Method to Thicken Milk Without Using Flour to Make A Roux! Use a cornstarch slurry! 🙂 I personally find the hardest thing about using flour to thicken milk is that I can never get the clumps of flour fully out whenever I add the milk to it. You also need to make sure you cook the flour long enough to remove that raw flour flavour. I find it much easier to just use corn starch to thicken things. I like to use a 1:1 ratio, for corn starch to water (and make sure you use cold water so that the corn starch doesn’t clump together). In the past, whenever I made cheese sauce, I found that I would lose a lot of cheese sauce because the sauce would burn onto the bottom of the pan (which made it difficult to wash off as well). To prevent these things from happening, I found that turning off the heat and using the residual heat from the thickened milk to melt the cheese, melted the cheese smoothly and prevented it from sticking to the pot. Double win! You just have to make sure the thickened milk is bubbling and very hot before turning off the heat and the cheese must be grated as well. Keep Your Instant Noodles Chewy! I find this tastes best when the noodles are not overcooked. You get a bit more of a chewy texture and less of a mushy texture. To prevent your noodles from being overcooked, you can subtract 1 to 1 and a half minutes from the cooking time given to you on the instructions. Comfort food 365 days a year. Combine the corn starch with cold water in a small bowl and set aside for later. Grate the cheese and set aside for later. Add milk, butter, soy sauce and spices (optional) into a pot, and give it a quick stir and set the stove to medium low heat. Once the butter melts and the milk has come to a low rolling boil (approximately 3-5 minutes), stir the corn starch slurry you made earlier (the starch settles to the bottom of the bowl), add the corn starch slurry into the pot. Keep stirring until the milk has thickened. Once the milk has thickened and it starts to bubble, turn off the heat and add in the cheese and stir until the cheese has melted and combined well with the creamy milk. Pour the cheese, into your serving bowl and set aside. Add the noodles on top of the cheese sauce in the serving bowl and mix well. If you prefer the cheese sauce is a little thinner, start by adding 1 tablespoon of the reserved water to thin it out a little. Add more water to thin it out even more. I like to use instant noodles with a thicker noodle. I find it has a chewier texture and it’s a bit harder to overcook. When shopping for them, they are usually the instant noodles made in Korea. If you like a runnier sauce, reserve 1-2 tablespoons of the instant noodle water when you are draining the noodles. Only add the reserved hot water, after you have mixed the noodles into the cheese sauce and you feel the sauce is too thick. WHOAAAAAAA. also, cheddar is life. american cheese is trash. (and not in a good trashy way like mcdonald’s mcflurries lol). 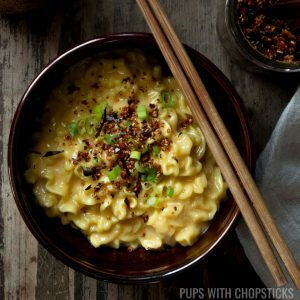 Furikake in mac and cheese. Now that is a great idea. With the toothiness of the ramen noodles, the cheddar and the soy, this mac and cheese that I can really get into. Going to have to try your furikake recipe soon as well. Yum! Love this mac and cheese twist! Looks like total comfort food and so quick to make too. 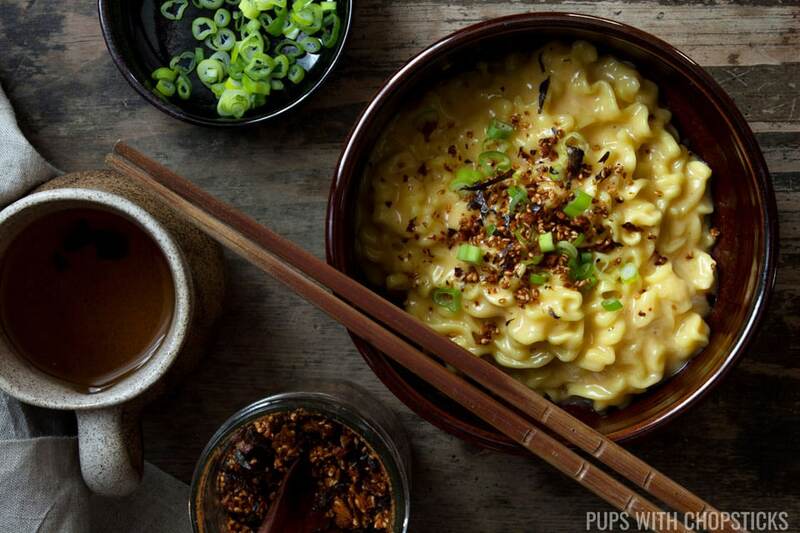 It such a great idea to add soy sauce in the cheese sauce for that extra umami flavour too. So much yum!